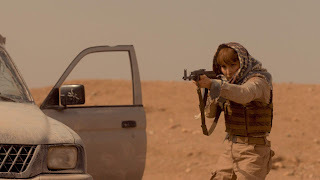 Determined to bring more authentic female characters to the action genre, filmmaker Vicky Jewson (Born of War) made the wise decision to let the characters drive the action in her latest work, releasing on Netflix on January 18. 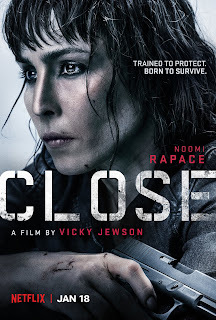 Inspired by the life of Jacquie Davis, one of the world's leading female bodyguards, Close is a film that's light on plot and heavy on action. Sharply choreographed by Eastern Promises stunt and fight coordinator Julian Spencer and thrillingly executed, Close's intense action begins right from the start as we meet our fictional Jacquie stand-in, Sam, played by Noomi Rapace. The very definition of the strong, silent type, we first encounter Sam on assignment in Sudan just before things go sideways in a pre-credit sequence that stylistically echoes the James Bond franchise. Adding to the 007 effect, Jewson's production is bookended by two catchy pop songs from the band Candy Says including the Shazam-worthy "Running Up the Hill," and "Beautiful Feeling," which play along with the film's opening and closing credits respectively. An expert in counter-terrorism with far more experience protecting assets in war zones than she does babysitting high value clients, Sam accepts what she assumes will be a temporary close protection officer assignment guarding Zoe Tanner (Sophie Nélisse), a rich heiress with abandonment issues still grieving the death of her father. Traveling with Zoe to a veritable safe house in Morocco run by the security team from her stepmother's (Indira Varma) company is supposed to mark the end of the assignment as far as Sam is concerned. Yet although discharged by the Moroccan security team, Sam agrees to stay at Zoe's insistence at least until morning when her time would officially be up, which turns out to be a crucial decision that drives Close's plot forward like a bullet train after the two barely make it out alive following a violent kidnapping attempt in the middle of the night. Soon realizing that instead of a random attack, they're being hunted, although they initially got off on the wrong foot, Sam and Zoe find themselves having to rely on each other as they try to survive long enough to identify the culprit behind it all. Featuring a strong turn by the ever-fearless Rapace, who trained with Davis and did all of her own stunts from heart-racing unarmed brawls to an underwater fight to the death, Jewson's technically stellar film, which was shot in just 29 days, boasts an ace crew including her longtime cinematographer Malte Rosenfeld and Bourne camera operator Klemens Becker. While the characters or rather their situation dictates the action as Jewson intended, Close's breakneck pacing and professional polish goes a long way toward helping us overlook the fact that we know about as much about Sam and Zoe as they do regarding the peril in which they find themselves during the film's ninety-four minute running time. Too often working off of context clues in the form of weak dialogue, although the action genre is full of heroes we know almost nothing about such as The Man With No Name and others whose lives get revealed throughout such as John McClane's in Die Hard, Close tries to have it both ways. Not knowing how to balance conversational scenes with first rate action, particularly when it comes to piecing together Sam's emotional backstory, Jewson and her co-writer (producer Rupert Whitaker) decide to bring us up to speed once and for all, clumsily and inorganically depositing a character in Morocco whose sole purpose seems to be telling the audience exactly what we need to know before getting shot. Regrettably, taking such a blunt approach to Sam as well as Zoe (whose own bio is literally shown to us in Sam's case folder) weakens their credibility by inviting us relate to the two more like we would heroines in a video game rather than fully three dimensional people. And while that's a definite misstep, everything else about Close — especially the gutsy, all-in performances by our leads — keeps us thoroughly invested. Better skilled at sticking the landing when it comes to the otherwise light plot, Jewson and Whitaker deliver some clever twists as the women try to figure out not only who is after them but also who they can trust. And even though my Netflix press screener was missing English subtitles in a few brief scenes conducted entirely in a foreign language, Close does a terrific job of showing rather than simply telling the viewer (as well as Sam and Zoe) just what exactly is going on by the final showdown. A far cry from action movies of the past that found damsels in distress resorting to running behind their male protector in a skirt and heels, while I wish Close's leads would've been better defined, it's impossible not to watch the film without a sense of vicarious pride as Rapace takes on any and all challengers by land or by sea. The first of at least two planned collaborations between Jewson and Rapace that center on bringing more authentic female heroes to the genre, luckily for Close fans, the helmer will also revisit Davis's life in a future eight episode planned Netflix series, based on her book.